Maxxis Minion DHFs have substantial side knobs. Plus bikes are one of the key growth areas of our sport, as riders discover bigger tire volumes and lower air pressures. But most of the available Plus tires thus far have very small cornering side knobs. Until now that is. 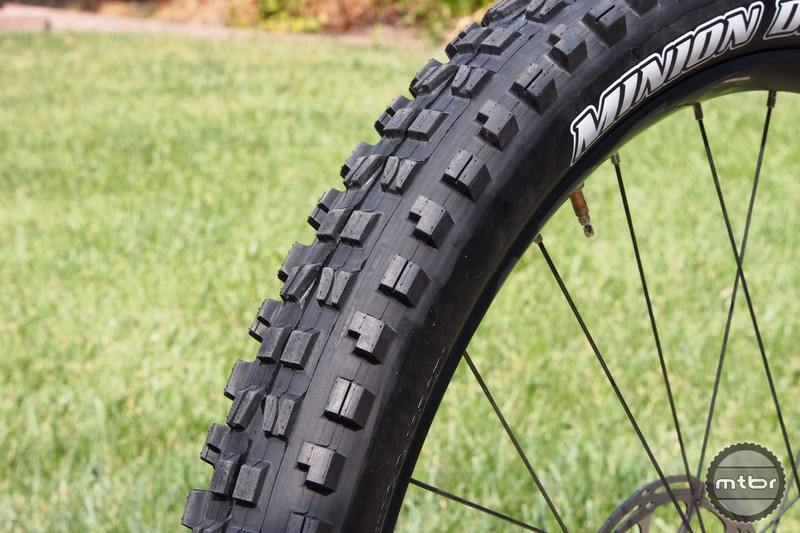 Maxxis has just sent us the 2.8” versions of their best selling all mountain tires, the High Roller II and Minion. Plus tires are indeed a revelation, as they provide ~ 60% more tire contact area compared to a 2.3” tire. Along with lower air pressures, this translates to better traction and better comfort for the rider. But just like initial 29er tires, the first gen of Plus tires have more of a semi-click, small knob pattern, with very thin casings. 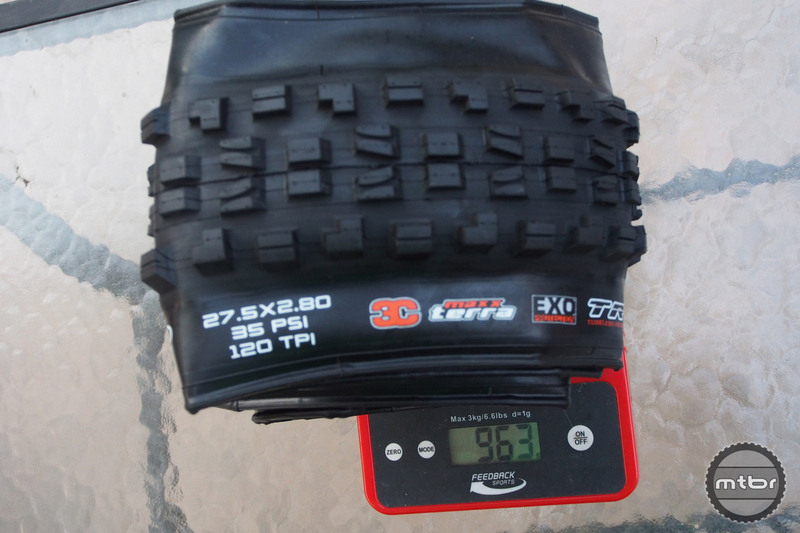 Width of the Minion DHF 2.8” is 68mm at 20 psi. The reason this has been done is to counter objections to Plus bikes and speed up their acceptance. Slow and heavy are the common prejudices, so the industry anticipated that and delivered the first blow with big tires with hardly any knobs. Performance was actually quite good because the contact patch was so big and the tire pressure so low (around 16 psi). But immediately, the market started clamoring for better tires. These bikes had significant potential in gnarly terrain so tires with studier side knobs and tire casing were needed. Minion DHF weight is 963 grams. The initial wave of Plus tires were 3.0 and rims were 30mm to 35mm wide. But now that we’ve learned a lot about these bikes and these tires, the industry has gravitated towards 2.8” tire and 40mm internal width rims. 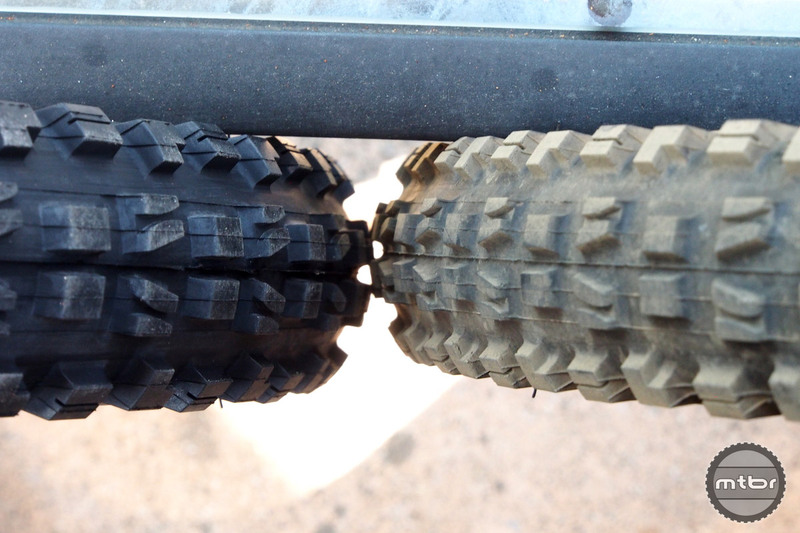 Simply put, 2.8” tires seem to ride aggressive terrain better than 3.0” tires. They achieve the happy medium between hard cornering, active jumping, and climbing. Couple that with the big knobs arriving and 2.8” makes a lot of sense. The 2.8” Minion is on the left compared to a 29×2.3” on the right. Key to the formula are 40mm internal rims, as they give these tires proper sidewall support. 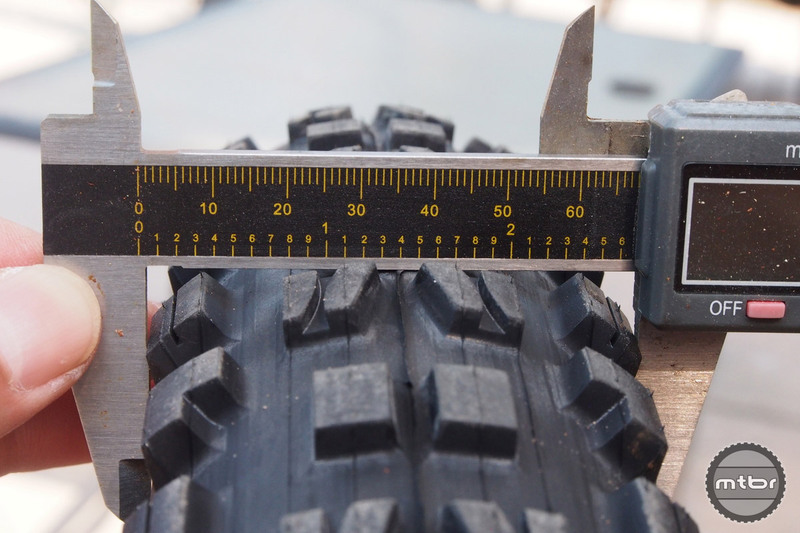 Tire pressure can be lowered sufficiently without too much of that dreaded sidewall squirm. Carbon rims and new aluminum construction help keep weight down, too. Consider this a great day for Plus bike users. I haven’t run the 2.8 yet, but I’m enjoying the 3.0 Ground Control so far. 500 miles on snow and dry. I’m interested in trying WTB next, but keep the articles coming! Don’t waste your time with the WTB plus tires. On my XC bikes I only run WTB Exiwolfs (for the last 8 years at least). I have a Cannondale Beast of the East with 3.0 Bridgers and they are HORRIBLE tires. Heavy, heavy, heavy. The Beast is a pretty terrible bike too. any idea when these will actually be available? destroyed nobby nics after 6 rides. rekons are holding up well but really want a more aggressive front tire. I have the Cannondale Bad Habit with 3.0 WTB Bridgers. I love Maxxis tires (I run the Highroller II on my Trance). But these are going to appear puny next to my 3.0 tires. Ugh. I think it’s quite a stretch to say ‘the industry’ has gravitated towards 40mm rims. Several of the key OEM’s (the ones who actually test and develop, instead of just follwing along) are hovering at 35mm where you get a less square tire which corners better and also offers a weight bonus over 40mm. Otherwise, indeed, a + sized Minion is for sure a good thing! Looking forward to the 26×2.8″ version of this tire, it will be the perfect 27.5″ outer diameter, and the best tire in the known universe. Couldn’t wait any longer. Picked up a DHF in 29×2.5 3C/EXO. Next time maybe I’ll give the plus version a try on the front if I feel I want the higher BB. Can’t wait to mount those 2.5’s though. Probably put another 100 miles on my Tomahawk 2.3 (which has been surprisingly awesome for 400 miles) before I switch them. Running with 30mm ID rims btw, so maybe the 2.5’s will be perfect anyway. @Reizga, I think Maxxis is also releasing the Minions in 29×3.0. I don’t know why this article skipped over that. Maxxis only having the Chronicle available currently in 29Plus is definitely a bummer. I think I saw it in one of the “New stuff from Crankworx” photo shoot pieces on pinkbike.